Welcome back to Marker Monday! 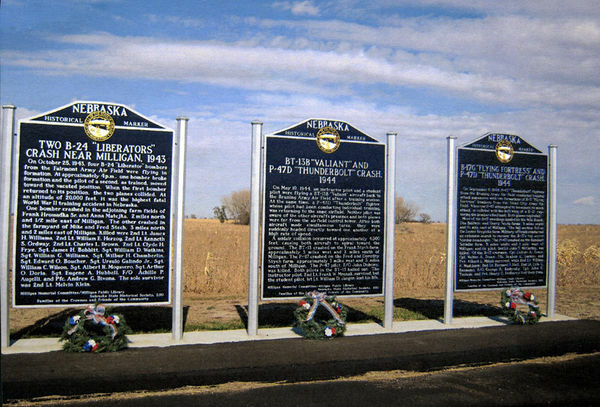 Each Monday we will feature one of Nebraska's hundreds of historical markers. If you'd like to see a specific marker featured, send an email to jill.dolberg@nebraska.gov. Marker Text: On October 25, 1943, four B-24 "Liberator" bombers from the Fairmont Army Air Field were flying in formation. At approximately 4 p.m., one bomber broke formation and the pilot of a second, as trained, moved toward the vacated position. When the first bomber returned to its position, the two planes collided. At an altitude of 20,000 feet, it was the highest fatal World War II training accident in Nebraska. One bomber crashed in the adjoining farm fields of Frank Hromadka Sr. and Anna Matejka, 2 miles north and 1/2 mile east of Milligan. The other crashed in the farmyard of Mike and Fred Stech, 3 miles north and 2 miles east of Milligan. Killed were 2nd Lt. James H. Williams, 2nd Lt. William E. Herzog, 2nd Lt. Kenneth S. Ordway, 2nd Lt. Charles L. Brown, 2nd Lt. Clyde H. Frye, Sgt. James H. Bobbitt, Sgt. William D. Watkins, Sgt. William G. Williams, Sgt. Wilbur H. Chamberlin, Sgt. Edward O. Boucher, Sgt. Ursulo Galindo Jr., Sgt. William C. Wilson, Sgt. Albert R. Mogavero, Sgt. Arthur O. Doria, Sgt. Eugene A. Hubbell, F/O Achille P. Augelli, and Pfc. Andrew G. Bivona. The sole survivor was 2nd Lt. Melvin Klein. Further Information: Two bombers crashed near Milligan on October 25, 1943. At 20,000 feet, the collision was the highest fatal crash in Nebraska. Four B-24 “Liberators” from the Fairmont Army Air Field were practicing flying in a diamond formation that afternoon. Formations were important because they helped guard against enemy fighters. Shifting positions within formations became necessary when planes were destroyed, so training missions included this. When 2nd Lt. Charles L. Brown, the pilot of the plane on the right side of the diamond, accidentally moved out of position, 2nd Lt. James H. Williams, pilot of the back plane, assumed he was leaving and moved to take his position. When Lt. Brown moved to retake his position in the formation, his plane collided with Lt. Williams’ plane. The crash resulted in a concussion that could be felt on the ground. Soon, pieces of Lt. Williams’ plane dropped from the sky. The wing was damaged, so the plane began to spin towards the ground. The plane’s copilot, 2nd Lt. Melvin Klein, tried to pull the alarm signaling for the crew to bail out, but was thrown into the center pedestal and knocked unconscious. Shortly thereafter, he was hurled through the windshield. While falling towards the ground, he recovered and managed to pull his parachute cord. When he reached the ground, he was found by a nearby farmer, Mrs. Krupicka, who brought him to the post office to be picked up by the military. He was the lone survivor of the crash. The plane took a long time to fall, but no other men were able to escape. Some of them were thrown from the plane as it fell apart in air. It exploded when it hit the ground. Lt. Brown’s plane stayed in air longer. It was damaged but stayed stable for some time. Lt. Brown and his copilot, 2nd Lt. Clyde H. Frye, looked for a place to crash-land the plane. No one bailed from the plane as it looked like it would land safely. Soon, however, the plane started to spin out of control and crashed into a chicken coop on a farm owned by the Stech family. It exploded on impact, killing everyone inside. The explosion and resulting fire killed many of the Stech’s farm animals. A number of people arrived to observe the scene while fire crews desperately attempted to stop the blaze. The Stech family received $1,372.80 in damages for the crash. Another family affected by the crash received $211.70. Blame for the crash was put on both pilots, as they both failed to communicate with the other about what was going on. The military later instituted rules that pilots in formation should radio each other before moving to another position. On November 3, 2003, the 60th anniversary of the crash, the wife and daughter of Lt. Williams visited the crash site in remembrance. Bibliography / Read on: Penry, Jerry. Nebraska’s Fatal Air Crashes of WWII. Milford: Blue Mound Press. 2009.